2.6% of all fractures and 44% of those in the shoulder girdle. (Postacchini F, JSES 2002;11:452). Men (68%) > women (32%). (Postacchini F, JSES 2002;11:452). Left side (61%) > right side (39%). (Postacchini F, JSES 2002;11:452). Middle 1/2 fractures are the most common (81%), are displaced in 48% of cases and comminuted in 19%. (Postacchini F, JSES 2002;11:452). Traffic accidents are the most common cause in adults. (Postacchini F, JSES 2002;11:452). S shaped: anterolateral surface is concave, convex on anteromedial surface. Middle 1/3 fractures typically heal with the lateral shaft fragment displaced posterior to the medial shaft fragment / anterior-posterior angulation. (Edleson JG, JSES 2003;12:173). Diameter of medullary canal is approximately 7mm at its narrowest point. (Andermahr J, Clin Anat 2006;20:48). Pain over clavicle, crepitus and motion at fracture site. Often obvious deformity. NV exam of upper extremity indicated; rule out axillary artery/vein injury. Auscultate chest to rule out associated pneumothorax. Medial clavicle fractures may have dysphagia and shortness of breath. A/P view of clavicle and 30°-45º cephalic tilt view of clavicle. Consider chest xray (including both clavicles) if there is significant deformity (shortening) or if concerned for pneumothorax or rib fx's. CT with 3-D reconstruction is helpful for segmental fractures or for medial clavicle fractures which may be missed on Chest xrays. 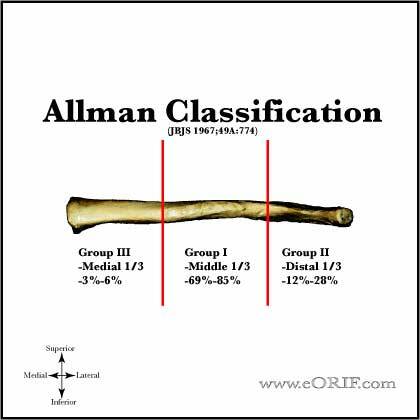 Allman Classification (Allman FL, JBJS 49A;774:1967). -Non-displaced: activity modifications, sling. No difference between sling and figure-8 (Stanly, Injury 19;162:1988), (Andersen K, Acta Orthop Scan 1987;58:71). Figure-8 has been associated with increased axillary pressure sores, compression of the neurovascular bundle, nonunion and patient discomfort. Closed reduction not helpful (Hill, JBJS 1997;79B:537). 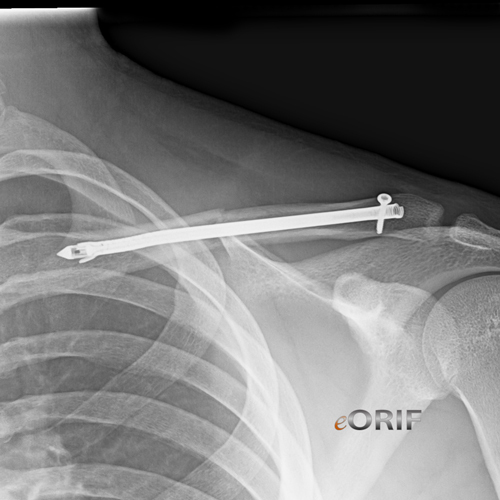 -Displaced: Clavicle Fracture ORIF 23515. Displaced = >100% displacement, Shortening >18 mm in males or >14 mm in females (Lazarides S, JSES 2006;15:191). Displaced fractures have improved outcomes with ORIF, decreased nonunion rate, shorter time to union, better shoulder funtinoal scroes (Guerra, Enrico, AJSM2019)(Canadian Orthopaedic Trauma Society JBJS;89:1), (Zlowodzki M, JOT. 2005 Aug;19:504) (Robinson CM, JBJS-A 2013;95:1576). Patients treated nonoperatively are more likely to be dissasisfied with shoulder droop, local bump at fracture site, shoulder asymmetry. Patients treated with surgery at more likey to be disatisfied with local numbness. Robinson CM, JBJS-A 2013;95:1576. -Operative indications=open fx, NVI, displaced fx with impending skin compromise, shortening >20mm, significant comminution, scapulothoracic dissociation. Consider for neurologic disorders, floating shoulder, bilateral fx, cosmesis, ipsiliateral UE fx, heavy laborers, high level athletes, obvious scapular winging. -Pediatric: Children younger than 11y/o have excellent outcomes with nonoperative treatment even for displaced fractures. Consider treating children at 12 and older as adults based on displacement. 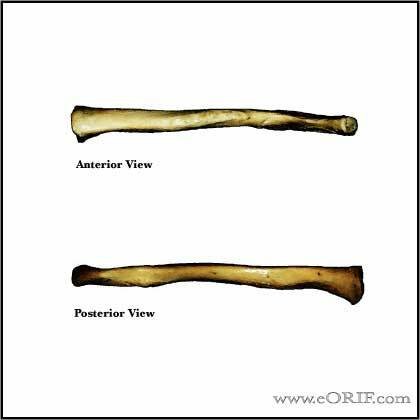 -See Clavicle Fracture ORIF 23515. 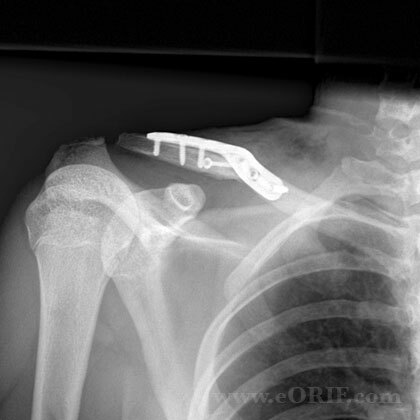 Group II-lateral 1/3=12%-28%: See Distal Clavicle Fracture 810.03. Group III - medial 1/3=3%-6%: generally associated with multisystem trauma; 20% mortality second to associated trauma; generally non-operative treatment (Throckmorton T, JSES 2007;16:49). 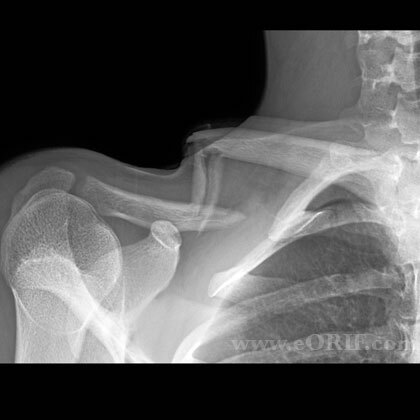 See Clavicle Fracture-Medial 810.02. See Clavicle Fx ORIF Technique. Associated complications: limited shoulder motion(61%), neurologic(35%), thoracic outlet syndrome(17%), arterial ischemia(4%) (Jupiter, JBJS 69A;753:1987). 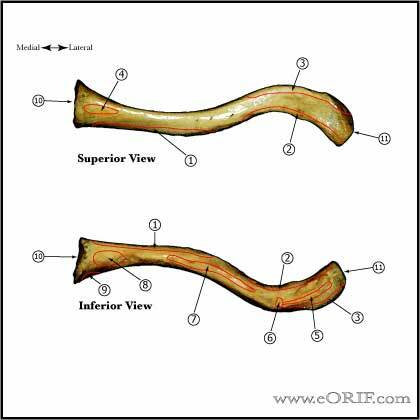 Treatment = ORIF +/- bone grafting. Malunion: principle deformity is anterior angulation. 46% do not feel fully recovered, 29% pain with activity at 10yr f/u (Nowak, J JSES 2004;13:479). 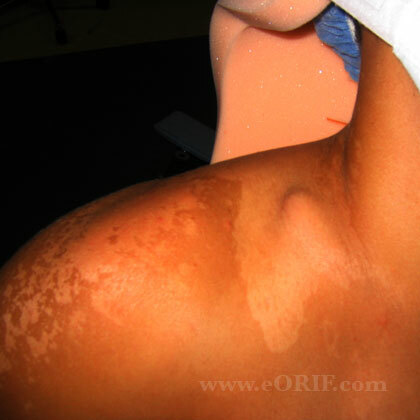 Often associated with mild scapular winging. Most patients will have major functional deficits including chronic pain, shoulder weakness and thoracic outlet syndrome. Treatment = ORIF. (McKee MD, JBJS 2003;85A:790). Sequelae of clavicle fractures: shoulder weakness, fatigue, paresthesias, cosmetic deformity, pain at rest or with activity, asymmetry. Post-op: sling for comfort, no overhead motion. Immediate pendelum ROM exercises. 10-14 Days: Wound check, sutures removed. Start PT for gentle ROM exercises. No resistive exercises/activities. Sling as needed for comfort. 6 weeks: Xrays, if union is evident begin strengthening and resistive exercises. No contant athletics. 3 months: Repeat xrays. If no signs of union, consider bone stimulator, see Nonunion. Return to sport: there shoulde be both clinical and radiographic evidence of union. Fracture site should be nontender, full shoulder ROM achieved and strength comparable to contralateral side. Generally avoid contact sports and heaving lifting for 4-6 months. Nonoperative outcomes: (Robinson CM, JBJS 2004;86A:778). Mean time to union = 28.4 weeks for non-operative treatment and 16.4 weeks for operative treatment for displaced clavicle fractures. (McKee MD, JBJS 2007;89A:1). Zenni EJ Jr, Krieg JK, Rosen MJ: Open reduction and internal fixation of clavicular fractures. J Bone Joint Surg 1981;63A:147-151. Canadian Orthopaedic Trauma Society. Nonoperative treatment compared with plate fixation of displaced midshaft clavicular fractures. A multicenter, randomized clinical trial. J Bone Joint Surg Am. 2007 Jan;89(1):1-10. McKee MD, Pedersen EM, Jones C, Stephen DJ, Kreder HJ, Schemitsch EH, Wild LM, Potter J. Deficits following nonoperative treatment of displaced midshaft clavicular fractures. J Bone Joint Surg Am. 2006 Jan;88(1):35-40.